It took a while to get this on the blog as the weather plays havoc with the internet. Greetings from Haiti. All of the following pieces were photographed and entered on this blog from Haiti. If you care to order anything e-mail me konnyskorner@gmail.com. I will be back home mid October and will mail it to you tousuit. 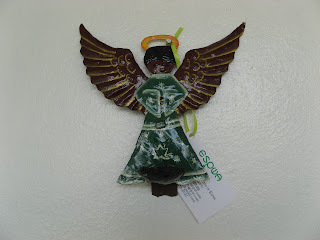 Haven't you always wanted an angel to put on your dresser or family room table? Well here you go. 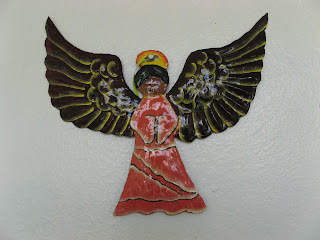 This angel has a fastener on the back to stand up on a table or to hand on the wall. She also has a place at her feet for a votive candle. This angel is $15.00 and stands 6 inches tall. These angels come in small, medium and large, and also come in a variety of colors pink, blue yellow, red and orange. . The small ones are $10.00 the medium $15.00 and the large $25.00.The small ones are 6 inches across, the medium 8 inches and the large 12 inches. There are quite a few new items for sale on the blog. please scroll down and note all the wonderful stuff the kids have been making. Your support of the arts and crafts department is vital to the continuation of this program. From the sale of the items the boys are able to buy more materials and now they are instituting a training program for the younger kids. Only good things can happen. Click on the angel to enlarge and you will see a delightful face. Display her alone or with some of the smaller angels pictured elsewhere on this blog. She sells for $15.00 and is 9 inches long. It can be used with the smaller angels for a mobile. The boys made some by using fishing line and they look fantastic. Stay tuned and I will put one together to show you how it looks. Most of the butterflies you have seen are multicolored. The beauty of this is the natural color of the metal varnished to show off the detail of the wings. the butterfly is 9x10 and can be yours for the low price of $20.00. Remember the reason for this blog, to bring to you an awareness of the talent of the boys of Pwoje Espwa and to give them a sense of accomplishment and purpose. We can't do it without your help. There are two butterflies with the long wings, one in the colors shown here and one in blue tones. the dimensions are 11x14 and they sell for $20.00. Please show your support for the boys that are making these crafts by your purchase. A new design by the boys of Artist Espwa, just when you think you have seen everything here is a new twist on an old design, aren't they clever these boys? There are many different color combinations in these sun/moons. I have only pictured a few here but some of the others are green, pink and yellow, brown and off white, green brown and blue, blue yellow snd green. All have the same design and sell for $20.00 and are 12 inches in diameter. If you e-mail me at konnyskorner@gmail.com I can send you the one that most satisfies your color schemes. The colors in the butterfly are vibrant yellow, blue and orange perfect for your house furnished with yellows and blues. There is another two sided butterfly with blue and an off white background. If that is more to you likeing just e-mail me at konnyskorner@gmail.com and I will send you that one. Butterfly here is 9x12 and the blue one is 15x11. Both butterflies are $25.00. I tried to hang the butterfly so you can see it is two sided, it is hard to see but take my word for it. Pretty colors yellow, blue and a very muted lavender it is 9x10 and sells for $25.00. There is a lot of work that goes into putting the two together. If you click on the picture it will enlarge and you can see the colors better. This butterfly has sold but there are a few more from which to choose. This sun is a little different from the ones below,it has a bronze face and is very very nice. It would look great in a room with dark furniture, suggestion an office or place of business. Some of our supporters have put them in their dental office and law office. Looks absolutely wonderful, a way to support the kids and give them exposure to the public. 12 inches and $20.00. A buy at any price. The next two suns are similar to this one except they have different patterned rays. They all are $20.00 and are 12 inches in diameter. If you look at the pictures of the boys in the act of creating you can see what a intricate process it is. Isn't it worth rewarding these kids with your support? They have worked hard to acheive this level of excellence and they are guided in Haiti by Paige. You have probably seen her face on Father Marc's blog. She is always smiling, do you think she enjoys what she is doing? This guy is a little different than the others, it has curved rays around the face. A 12 inch diameter gives you the option to put on a wall alone or in combination with others. for $20.00 you have a bright and lively sun and you are also helping the kids. That is our goal right? This sun as all the others is 12 inches in diameter. There are three or four different one from which to choose so make your selection carefully. Or if you can't decide buy more than one. As always pay pal is the way to go, it is quick easy and safe. Buy now for $20.00 Remember all the proceeds go to Pwoje Espwa arts and crafts. This is Honel who first met Father Marc in Camp Perrin in 1998. His mother lived in Port au Prince and because he had no father he took care of his 4 younger brothers . He started by making Christmas cards to bracelets and now metal crafts. The group is working on a forming a cooperative among themselves, one is good at design, one at painting, another cutting the patterns so all in all it has been a learning experience for all of us. He is here holding a candy cane ornament and angel. Sammy on the top and Jean Remy are brothers. When Sammy was 7 and Jean Remy was 6 they were brought to an orphanage in Port au Prince because their parents could not take care of them. It was operated by Catholic sisters and the boys remember all of their names . When they were 12 they were put out on the street and there they survived until they worked their way to Cayes . Their sister introduced them to Father Marc three years ago and they have been there since. Their talent was discovered and they have been making crafts and a lot of the articles on the blog are their creations. Here Sammy is cutting out stars with a hammer and chisel ( I think). Not too easy to do. Jean Remy is making a star three dimensional. Sammy is now 19 and Jean Remy 18. The moon and the star are 3 inches and there are 26 stars and 10 moons. They also can be hung on a tree and would look better in multlples of three (mix and match) so that is how they will be sold. 3 for $10.00 is a good price don't you think? e-mail me and I will ship immediately, stars and moons can be enjoyed any time of the year as can the angels. These are the angels that are ready for sale. Blue, pink, green , the one with the spots is a brownish black color and there are some that are unpainted . They can be hung on a Christmas tree by using an ornament hanger there is a little hole in the end of the wing for that purpose. See below for ordering instructions. There are 14 painted angels and 9 unpainted. The angels are $10.00 each and all you have to do is e-mail me with your order and I will mail them to you, let me know quantitiy and colors. The only extra is the cost of the postage. The figure seen here is a very important part of the 1804 Revolution when Haiti won its independence from France. The troops were alerted by the blowing of the conch. Honel is the artist who crafted this piece. It sells for $25.00 and is 18x 6. As always pay pal is the easiest way to go. The first phase in the finishing is to put a coat of rust proofing on the pieces called an oxidant and then paint the pieces white to await the final colors. There is a very involved process that takes place to create a painted piece and it is done in the small confines of a room or on the small porch. We are hoping to raise enough money to build a workshop where the artisans can create and sell their works in one place. The picture on top is the third step in the creative process. Here the angels are put on a piece of metal and varnished to keep the colors vibrant. They come in blue, pink, green and natural color. When ordering specify color or get a variety of all of them . They are $10.00 each and can be ordered by e-mailing me at konnyskorner@gmail.com. I will then add the postage and e-mail you with the total amount. New napkin holder design, a little smaller than the others but perfect for cocktail napkins on the bar. Colorful yellows and greens with a bird motif. Easy to ship and easy to pay using pay pal. They are 5 inches high and about five inces wide. A good deal at $10.00 each. These perky little birds were made for the Swallow's Festival but arrived a little late, therefore your good fortune. They can be used as soap dishes or to hold a votive candle. We are selling them 2 for $15.00 so if you only want one I am sure a friend would want one too. They can be used outdoors for your summer parties and can also be used as business card holders. If any of you are in the bird business they would be rather eye catching. We have 8 in the inventory right now. Large poster with the picture sent by Portia. Now the customers have faces and names to put with the work. Thank you Portia. Some of the art dispayed at the Swallow's Festival. We had a good two days of sales and konnyskorner would like to thank Sheila, Barbara, Dorothy and Carol for their help in setting up and selling the work. The white paper on the top just states that all the proceeds go to Pwoje Espwa.